In so doing, Mr. Bush was not making a radical departure from the practices of his predecessors. Rather, he was keeping a bipartisan tradition that has now endured for centuries with harm neither to believer nor to atheist. It is a tradition that reminds us that the founders of America conducted their labors in the light of Sinai. Which in itself is something for which to give thanks. First published November 22, 2006 at NYSun.com. Reprinted here Nov. 16, 2017 for educational purposes only. Visit the website at nysun.com. 1. The purpose of an editorial/commentary is to explain, persuade, warn, criticize, entertain, praise or answer. What do you think is the purpose of this NYSun editorial? Explain your answer. 2. 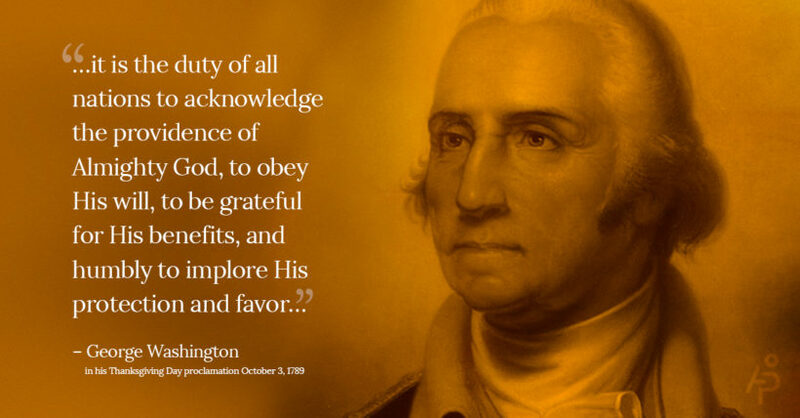 For the full text of every Presidential Thanksgiving Proclamation, go to: pilgrimhallmuseum.org. Read the Thanksgiving Proclamations of your favorite president. What is most surprising to you about his proclamations? James Madison, 1814: “[A] day on which all may have an opportunity of voluntarily offering at the same time in their respective religious assemblies their humble adoration to the Great Sovereign of the Universe, of confessing their sins and transgressions, and of strengthening their vows of repentance and amendment. For the full text of every Presidential Thanksgiving Proclamation, go to: presidency.ucsb.edu or pilgrimhallmuseum.org.